Viknesh Vijayenthiran November 19, 2014 Comment Now! Audi’s forward-looking Prologue concept has finally landed, and it’s bigger and bolder than ever. The stylish coupe doesn’t preview any one particular model currently being developed, but instead showcases a new design language for the entire Audi brand crafted by German designer Marc Lichte, who took over the design reins at Audi late last year. 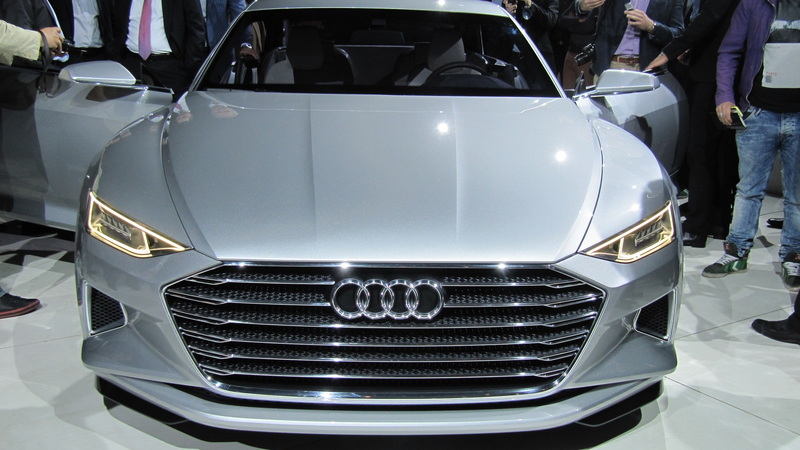 In designing the Prologue, Lichte said he wanted to encapsulate core Audi themes such as sportiness, lightweight design and quattro all‑wheel drive, and present them in the form of a luxurious coupe. Specific models from Audi’s past that have influenced the design include the Audi 90 quattro IMSA GTO race car from 1989 as well as the original A8 and TT. The dominant feature is the signature singleframe grille, which is much wider and lower than before. Its strong horizontal effect expresses an image of powerful dynamics. The headlights feature a new graphic and combine two separate technologies, laser light and Audi Matrix beam-splitting, for the first time. From the side, the muscular fenders mimic those of the Ur-Quattro, and moving to the rear we see a new theme: the trunklid is angled in the driving direction and is reminiscent of the side and rear views of a luxurious yacht. Vast areas of the stiff multi-material body of the Prologue consist of aluminum and ultra-high-strength steel. The windows are framed by matte and polished aluminum trim strips, and at the end of the low roof dome, the window framing transitions into a solid surface of aluminum. The concept stretches 16.7 feet in length and has a width of 6.4 feet, yet its height is just 4.6 feet, emphasizing its powerful stance. And its wheels are massive 22 inchers, with huge 20-inch carbon ceramic brake discs sitting within. The interior marks the beginning of a new design era at Audi, in which the architecture merges with the operating concept to form one unit. The surfaces for displays and controls are integrated into the instrument panel and console of the center tunnel; in fact, the whole dash can be viewed as one big display. Many of the screens feature an extremely thin, bendable OLED film. Many are also touch sensitive, meaning they can replace many physical buttons, leading to what Audi calls the virtual cockpit. One interesting feature is the concept’s "butler." This is a software program that identifies the driver based on his or her smartphone and adjusts the seats and climate control system according to their preferences. The system also makes recommendations for music and route planning. For the passengers, a special mechanism networks their own smartphones to the vehicle infotainment system and charges them. But it’s not just the look of new Audis being previewed with the Prologue; the concept is also packed with new drivetrain technologies that will eventually filter across to Audi’s production cars. The first model to be influenced by the Prologue will be the next-generation A8, which recently started public road trials in test mule form and is expected to debut in 2016. 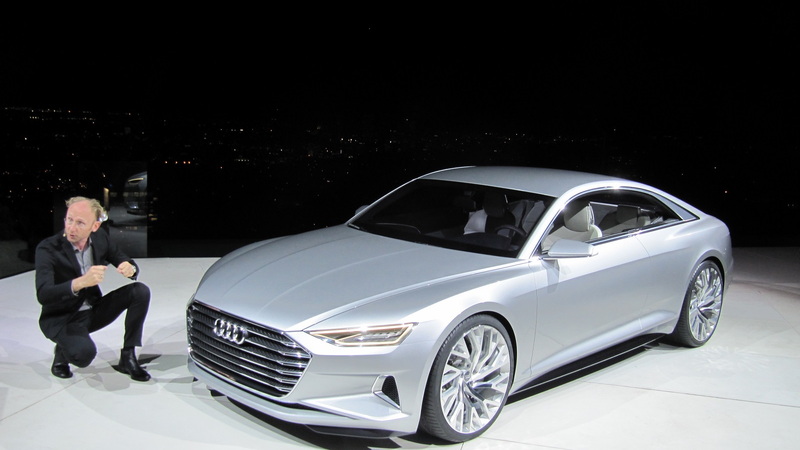 The concept’s roof profile should also appear on the next-generation A5. Beneath the pretty sheet metal is Audi’s next-generation MLB Evo platform, which debuts in the 2016 Q7. A key element is the new suspension which features a lightweight five-link setup front and rear. There’s also an “adaptive air suspension sport” feature that offers a large adjustment range between smooth rolling and very tight handling; it also varies the concept’s ground clearance over several levels. Another technology highlight is a new all-wheel-steering system. Called dynamic all-wheel steering, the system allows rear-wheel steering angles of up to five degrees, which helps make it easy to maneuver when parking and makes steering adjustments more accurate and stable at higher speeds. Power comes from Audi’s familiar 4.0-liter TFSI, which in the Prologue has been tuned to deliver a massive 605 horsepower and 553 pound-feet of torque (with overboost). It accelerates the concept from 0-62 mph in just 3.7 seconds, which isn’t bad considering the vehicle weighs a hefty 4,365 lbs. The transmission is Audi’s eight-speed tiptronic automatic. One final new feature presented on the Prologue is a new 48-volt subsystem of the vehicle electrical system. Soon to be featured on Audi's production cars, the system helps power all of the ancillaries and draws its power from a motor-generator that recovers energy during braking, thus helping to conserve fuel by taking some load off the engine. As for production version of the Prologue, Audi has long been rumored to be considering a new flagship positioned above the A8, the alleged A9, so could the concept also be a preview of this flagship, a potential Mercedes-Benz S-Class Coupe rival? We certainly hope so as the clean lines and dynamic proportions of the Prologue are just begging to be put into production. 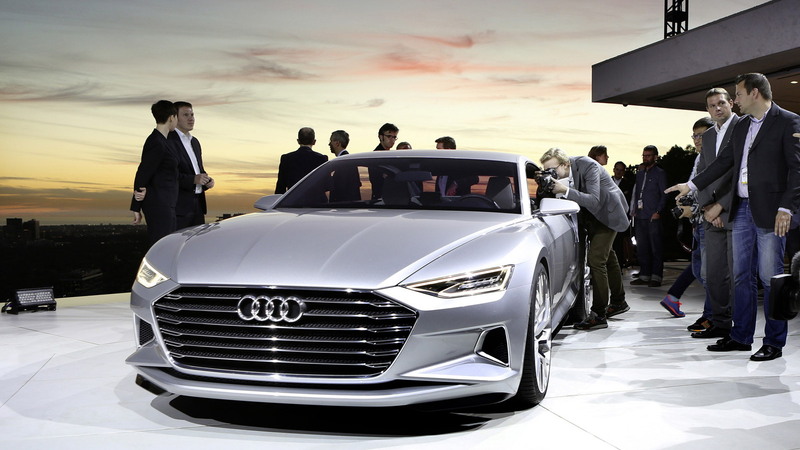 For more from the 2014 Los Angeles Auto Show, head to our dedicated hub.